Now, shops who have an active ProDemand/ShopKey Pro account can now use a new feature that not only gives you the Service Reminder Reset directions for all makes and models, but also the fluid amounts and types for each vehicle. 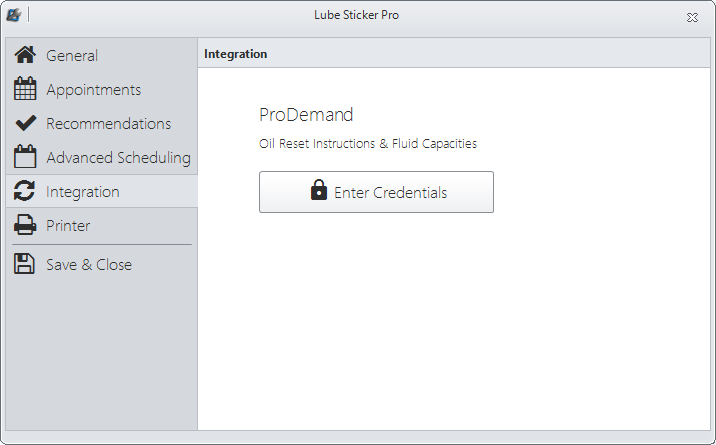 First, download and install the update, go to Lube Sticker Pro> Settings> Integration, and enter your ProDemand credentials; then click Save and Close. You will find the new information by clicking the same button that you used to previously access this information. If you don’t have a Pro Demand/ShopKey account, you will still be provided with Maintenance Service Reminder Reset information in Lube Sticker Pro as you always have. 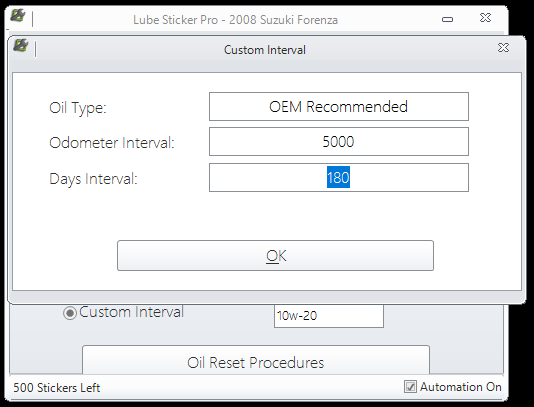 One way to continue to use and set the OEM intervals is to enter the information as needed in the Custom Interval part of Lube Sticker Pro. To do this, have an RO open and start Lube Sticker Pro. Click on the circle in front of “Custom Interval” to open the editing window. Enter “OEM Recommended” in Oil Type, and the OEM suggested Odometer and Day Intervals in the proper fields and click OK to save. In the open field, under the Print button, you can enter the oil weight and/or type. Once you click Print, the info will be permanently connected to this vehicle, so you won't have to enter the information again. Each subsequent oil change interval for this vehicle will be based on these settings unless changed. Lube Sticker Pro will now use this information to calculate the customer’s next oil change based on the OEM information you have input for both mileage and days.